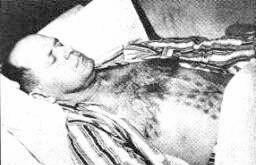 The experience of Stephen Michalak in the Falcon Lake area in Manitoba, at noon on May 20, 1967, is a CE-II (Close Encounter of the Second Kind) on two counts: physical traces were found on the area where the UFO reportedly landed, and the witness experienced a series of physiological effects apparently linked to his close encounter with a metallic-looking, disc-shaped object. Michalak is an industrial mechanic from Winnipeg who was doing some amateur prospecting in the area. 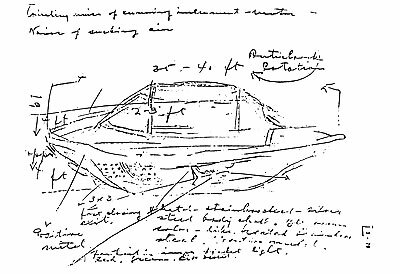 Drawing with notes by Michalak of the landed UFO he encountered at Falcon Lake. Notice grill pattern (encircled) and compare to burn marks above. From the declassified files of the RCAF and RCMP. Courtesy of ICUFON Archives. "A Mr. Steven Michalak of Winnipeg, Manitoba reported that he had come into physical contact with a UFO during a prospecting trip in the Falcon Lake area, some 90 miles east of Winnipeg on the 20 May 67. Mr. Michalak stated that he was examining a rock formation when two UFOs appeared before him. One of the UFOs remained airborne in the immediate area for a few moments, then flew off at great speed. The second UFO landed a few hundred feet away from his position. As he approached the UFO, a side door opened and voices were heard coming from within. "Mr. Michalak states he approached the object but was unable to see inside due to a bright yellow bluish light which blocked his vision. He endeavored to communicate with the personnel inside the object [in English, Russian, German, Italian, French and Ukrainian], but without result. As he approached within a few feet of the object, the door closed. He heard a whining noise and the object commenced to rotate anti-clockwise and finally raised off the ground. He reached out with his left gloved hand and touched the object prior to its lifting off the ground; the glove burned immediately as he touched the object. "As the object left the ground, the exhaust gases burned his cap, outer and inner garments, and he sustained rather severe stomach and chest burns. As a result of these he was hospitalized for a number of days. The doctors who attended and interviewed Mr. Michalak were unable to obtain any information which could account for the burns to his body. The personal items of clothing which were alleged to have been burnt by the UFO, were subjected to an extensive analysis at the RCMP Crime laboratory. The analysts were unable to reach any conclusion as to what may have caused the burn damage. "Soil samples taken by Mr. Michalak from the immediate area occupied by the UFO were analyzed and found to be radioactive to a degree that the samples had to be safely disposed of. An examination of the alleged UFO landing area was made by a radiologist from the Department of Health and Welfare and a small area was found to be radioactive. The Radiologist was unable to provide an explanation as to what caused this area to become contaminated. Photograph of Stephen Michalak showing the geometric burn pattern on his body. Courtesy of ICUFON Archives. Yet a careful review of all the physical and medical evidence collected by the RCMP and others could easily lead one to the opposite conclusion. Moreover, some of the physiological effects reported in the Falcon Lake incident are not isolated events in the UFO literature. Aerospace engineer John Schuessler has been documenting UFO medical cases for many years, compiling a Catalog of Medical Injury Cases. The 1995 version of the catalog contains approximately 400 cases.73 Although this particular field requires further research, it is one area where at least "partial proof" can be offered. 65. "UFO Report - Falcon Lake, Man." Document in the RCMP case file; no author, agency or department are identified. 66. Gilmor, Daniel S., ibid. 67. Rutkowski, Chris, "The Falcon Lake Incident," 3-part article published in Flying Saucer Review, July, August and November 1981. 68. Bissky, S/L P., "Report of an Investigation Into the Reported UFO Sighting by Mr. Stephen Michalak on May 20, 1967 in Falcon Lake Area," in the RCAF file. 69. Scott, DJ, Deputy Base Surgeon, Memorandum to S/L P. Bissky, May 26, 1967; in the RCAF file. 72. Craig, Roy, "Case 22 North Central Spring 67," in Gilmor, D.S., ibid. 73. Schuessler, John F., "Developing a Catalog of UFO-Related Human Physiological Effects," MUFON 1995 International UFO Symposium Proceedings.